Catch The Horne Section at Southbank Centre’s Purcell Room at Queen Elizabeth Hall from 30 October – 2 November. Get tickets here. Next week they join The Horne Section on Friday 2 November as special guests alongside Dave Gorman for a night of spontaneous stand-up, spectacular performance and outlandish musical talent. Listen to Frisky & Mannish with The Horne Section in their rendition of Rihanna’s Rude Boy in the style of The Bee Gees. Catch Frisky & Mannish and The Horne Section at Southbank Centre’s Purcell Room at Queen Elizabeth on Friday 2 November. Get tickets here. Just announced – Dave Gorman headlines The Horne Section show on 2 November! Gathering together the UK’s finest musicians and throwing them on stage with the world’s most exciting comics, Alex Horne has created a truly unique comedy experience. This is a heady mix of spontaneous stand-up, spectacular performance and outlandish musical talent. Hot on the rhythmic heels of their very own Radio 4 series and three years of sell-out shows at the Edinburgh Fringe Festival, the West End and across the world, the Horne Section bring their indomitable late night fanfare to Southbank Centre. We’re also very excited to announce that the headliner for Friday 2 November is comic-genius and Absolute Radio-presenter, Dave Gorman, who brought his brilliant PowerPoint presentation to Southbank Centre earlier this year. 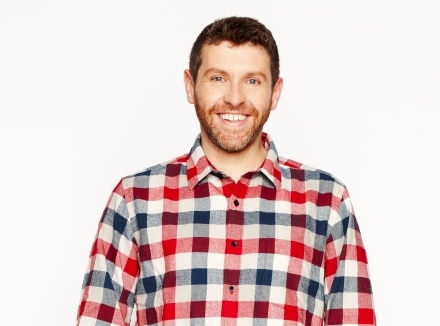 Catch Dave Gorman headlining The Horne Section at Southbank Centre’s Purcell Room at Queen Elizabeth Hall on Friday 2 November. Get tickets here. Recreating the unique spirit of 1940s radio plays and brilliantly evoking a dinner-jacketed age of casual imperialism and stiff upper lips, the Fitzrovia Radio Hour’s brand new show comes fresh from three critically acclaimed London residencies, and two sell-out years at the Edinburgh Fringe. Here’s Fitzrovia Radio Hour’s guide to Red Cross Week 2012. Spiffing, what what! Catch Fitzrovia Radio Hour at Priceless London Wonderground at Southbank Centre on Saturday 29 September. Get tickets here. Get to know… Dave Gorman! Boredom. I mean there are things far scarier than that, things that might crop up occasionally – I was once in a car crash for example – but I don’t spend any time being fearful of them happening. But I fear getting into a rut. There’s no way of rehearsing comedy. It needs an audience otherwise it’s just words. Getting the words right means nothing… it’s playing the mood of the audience that gives you a sense of timing so it can’t be practised abstractly without an audience. So the first time you say something on a stage and it all clicks just right and you nail a bit… that’s pretty perfect. Hero is an odd word for me. I’m not sure the characters I like most are heroic. I love John Irving’s work and ‘Garp’ is probably my favourite of his novels… but is Garp a hero? If it’s a real hero you’re after I’d go for Atticus Finch in ‘To Kill A Mocking Bird’… but there are unheroic characters I like more. The science writer, Simon Singh. Libel is an expensive business. Defending a libel suit is time-consuming and expensive. Even if you’ve done nothing wrong and win the case you will most likely be thousands – possibly hundreds of thousands – of pounds out of pocket. Which is why the law is abused by rich people to silence their critics. It’s easier to take down a website or apologise for your article than it is to risk the livelihood of you and your family. When the British Chiropractic Association accused Simon of libel he didn’t crumble when pretty much anyone else would. He stood and fought… and then went on to challenge the law. Libel reform is coming and many people have been fighting for it for years. But Simon’s courage in the face of such adversity was deeply, deeply impressive. I wish I could play an instrument. Any instrument. Maybe I can. I’ve never tried to play a trumpet. Maybe I’m an undiscovered trumpet savant. But I doubt it. I’ve loved playing there and I’ve seen some amazing shows there too. But it’s difficult to top watching two women taking a life-sized model deer with them into one of the dining establishments. Representing the deceased, I’d have Jaques Tati, Tommy Cooper, Morecambe & Wise and Ian Dury. Representing the living I’d have Tim Minchin, John Hegley, Helen Love and Mistys Big Adventure. But not necessarily in that order. Ask me again tomorrow and I’ll probably have a different answer. But www.futilitycloset.com is charming me right now. The Story Of Love by Mistys Big Adventure. Catch Dave Gorman’s PowerPoint Presentation at Southbank Centre’s Queen Elizabeth Hall on 16 June. Get tickets here! Only two weeks to go before the ‘wildly funny’ (New York Times) Umbilical Brothers hit the Queen Elizabeth Hall stage, set to tickle your funny bone with their off-the-wall beatboxing antics. Having been nominated for the prestigious Perrier Comedy Awards, The Umbilical Brothers are in London for two nights only! Catch The Umbilical Brothers at Southbank Centre’s Queen Elizabeth Hall on 6 & 7 April 2012. Get tickets here.